On Koh Samui there are many citizens who consider themselves Thai but are actually natively Chinese, and as such they continue to celebrate the Chinese New Year in style. Even those not of Chinese origin love joining in the lively festivities. 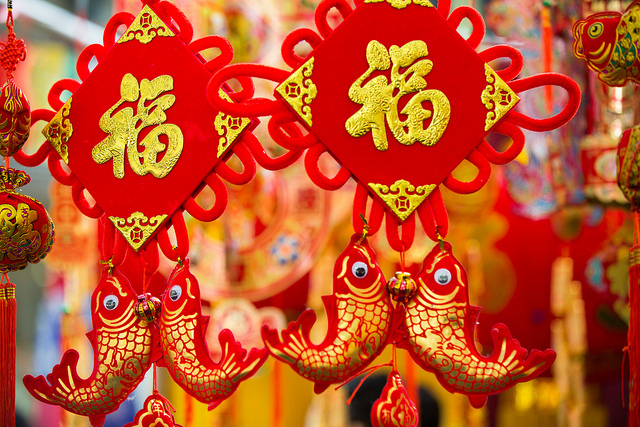 Here are a few things you should know about celebrating Chinese New Year in Koh Samui. Chinese New Year originates from a myth about a horned creature – possibly a dragon – called Nian (which means “year”). On New Year’s Eve it would rise from the depths of the sea and devour all the harvest and all the villagers. Fortunately, the villagers soon discovered that the creature avoided people wearing red clothes and that it was afraid of loud noises. Hence why you will see a lot of red everywhere and risk going deaf from all the fireworks and clapping. There will be plenty of red lanterns hung everywhere, some markets will sell red items of clothing to celebrate the occasion and maybe even some houses might be painted red. The main place to be on this night is in Maenam, near the Chinese temple – near to where the Thursday walking street is, for those familiar with Maenam. Here, you can see a spectacular parade with a dragon, a lion dance, acrobats on stilts and, of course, the fireworks. The lion dance is particularly fun to watch and it is thought to bring good luck. The lion dances along the street to cymbols and drums. The head of the lion is a mirror, and it is believed to scare away evil spirits by showing them their own reflection. As the lion moves from place to place it hunts for green vegetables, such as lettuce, which are hung above the doors of houses and some businesses. The lion then scatters the leaves to symbolise a fresh start and good luck for the new year. Oranges and tangerines are also a symbol of wealth, happiness and longevity and they are sold in the nearby market stalls. In previous years there have been celebrations at the Chinese temple in Nathon (Hainan Temple) or in the Chinese temple of Guan Yu (“red-faced warrior”) in Hua Thanon, so if you are too far from Maenam, these are also good places to share the fun. The parade also includes a procession of Chinese mythological creatures to bless residents and tourists for the upcoming year. Be prepared for a very long party – longer than a full moon party – as some Chinese New Year festivities have been known to last 15 days. The bigger the Chinese community in the area, the longer the party will go on for. Although it is not an official public holiday in Koh Samui, it is so popular among the native Chinese residents that some Chinese-owned businesses will close for a day or two to mark the occasion. If loud noises do not appeal to you then it might be a good idea to stock up on ear plugs! The most important thing to bring is your patience and a positive attitude – the best thing to do is just go with the flow and have fun with the locals. This is a celebration like no other you have taken part in before.